Farmhouse with 5 Bedrooms, 3 Bathrooms, Large Private Heated Swimming Pool & Free Broadband WiFi Internet. Large livingroom/kitchen/dining room with 2 french doors, solid oak floors & staircase L shaped 6 seater leather sofa, second large sofa & armchair, coffee table, SateliteTV . Large oak dining table and seating for 10. Sink and base units, solid oak island cabinets, dishwasher, gas hob, electric oven, large fridge/freezer, microwave, toaster & electric kettle. Washing machine, washing basket, ironing board, iron, exterior rotary clothes dryer, travel cot & highchair. 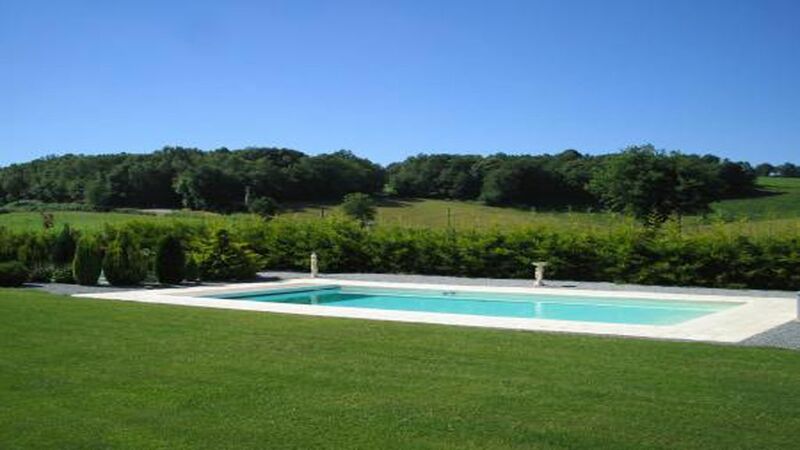 Farmhouse with 12 m x 6 m private heated swimming pool & free WiFi broadband internet access. Conveniently located within five minutes of all the necessary amenities. The local village just 5 min drive provides a bakers, grocers, post office, chemist, bars and restaurants. The local towns of Magnac Laval, Le Dorat, Bessines, Bellac and La Souterraine 10 -15 mins drive provides banks, hypermarkets, lots of shops, bars and restaurants. 20 mins drive to the beaches of Lac de Saint-Pardoux, 30 minutes to Limoges. Outside: 12m x 6m private solar heated swimming pool, 25m long stone patio with traditional French oak framed covered terrace, Large wooden dining tables and chairs, cushioned sun-lounger beds, cushioned rattan sofa and armchairs, coffee table, parasols & large BBQ. We had a wonderful 2 week stay at your beautiful farmouse, the house was very well equipped, spotlessly clean and the furniture and beds were 5 star. The large heated pool had a shallow end with full width steps ideal for small children and a deep end for the adults, and the exterier of the house had a wonderful covered terrace for alfresco dining, a large wooden dining table, plenty of dining chairs and a large barbecue. Also the stone patio and gardens were great, there were 3 parasols and lots of comfy sunlounger beds. The nearest village for freshly baked bread and coissants is only 5mins by car and has a restaurant, grocers and butchers etc, and there is a wonderful restaurant in Magnac Laval that is open 7 days a week and serves a 3 course menu du jour at 13 euros. There is also a beach and childrens play area at Lac de Pardoux very close to the property. The caretaker was great and nothing was too much trouble, we would highly recomend the property and the area to family and friends, we had a fantastic time. This is a wonderful place to spend a very relaxing holiday, really luxurious feel to the property, beautifully furnished, extremely clean and very well equipped. The location, gardens and large heated pool are fabulous and we would definitely recommend the property and the area to friends and family. Thank you so much for your kind and generous review, we are very happy you had a relaxing holiday and we very much hope to see you all again soon. Perfect holiday spot for us, the house was beautiful and spacious and the furnishings were lovely, a wonderful place for a family holiday. The children and adults loved the heated pool and we had great weather very dry and warm. We highly recommend the property and the caretaker was excellent and looked after our every needs. Thank you so much for taking the trouble to write such a wonderful review, we are so happy you had a good time. Just returned from a holiday at La Porte. The property was perfect for the 10 of us (including 5 primary school aged children). The outside space - including a wonderful sized pool - was perfect for relaxing and enjoying the French sunshine. The property was clean and well equipped and was very professionally and courteously managed by the owners and caretaker right through from booking to arrival to departure. We had a great holiday. Many thanks for your wonderful review, we are so pleased you had a great holiday and we hope to see you again. Le Dorat has an important 12th century church in the Romanesque style, the Collegiale de St. Pierre and a fortified gate unique to the Limousin region it also has an outlet store for Limoges porcelain a wide range of shops, bars, restaurants superstores and of course a weekly market on Wednesday & Friday mornings. Lake St. Pardoux A20-15 minutes drive with 3 beach areas, surrounded by woodlands, ideal for mountain biking, horse riding, jogging, and walking. 330 hectares of lake where you can take part in a number of water sports - (water-skiing, wind-surfing, canoeing, pedalos, fishing, swimming or simply laying on the beach soaking up the sun. There are restaurants, tennis courts, children's play areas, water chutes, boating, water sports, horse-riding, fishing, bicycle & nature trails all on the doorstep. The nearest airport is Limoges A20-30mins away (from Stansted with Ryanair) https://flights.ryanair.com/en-gb/flights-to-limoges or from Southanpton with flybe https://www.flybe.com/cheap-flights/limoges/. The ferry port at Portsmouth with ferries to Cherbourg, Caen, Le Havre & St Malo with Brittany ferries http://www.brittanyferries.co.uk/ferry-routes/ferries-france/portsmouth-france. Distances from Caan 425 km, St Malo 447 km, Le Havre 522 km, Cherbourg 530 km and Calais 636 km. Park Zoo Reynou - 35 minutes Located in Le Vigen, south of Limoges, Reynou Park is a tourist and cultural place, where everybody will observe, understand and appreciate animal and vegetable kingdom. RENTAL AGREEMENT & TERMS & CONDITIONS; A fully refundable security/damage deposit of 500 euros to be paid on arrival and will be transferred back to your bank account, (less any breakages), within 7 days of your departure. . Arrival and departure cleaning, bed linen & inside towel hire: 100 euros to be paid on arrival. Please bring your own pool/outdoor towels. Check-in and check-out times: Arrival: 17.00, Departure: 10.00 Smoking: Smoking is not allowed inside. Swimming pool: The pool is solar heated from June-September. Cancellation Policy: Cancelled bookings will not receive a refund. The house can be rented with either 5 bedrooms & 3 bathrooms (sleeps 10 maximum 8 adults) or 8 bedrooms & 6 bathrooms (sleeps 16 maximum 12 adults). The 5 bed (images 1-39). The 8 bed (all images). Whether you rent 5 or 8 bedrooms the house will be private and you will have sole and exclusive use of the house, pool and gardens. CONTRAT DE LOCATION, TERMES ET CONDITIONS; Un dépôt de sécurité / dommages entièrement remboursable de 500 euros à payer à l'arrivée. Nettoyage à l'arrivée et au départ, draps, couettes, oreillers et frais de location de serviettes à l'intérieur de 100 euros à payer à l'arrivée. S'il vous plaît apporter votre propre piscine / serviettes d'extérieur. Heures d'arrivée et de départ: Arrivée: 17h00, Départ: 10.00 Fumer: Il est interdit de fumer à l'intérieur. Piscine: La piscine est chauffée à l'énergie solaire de juin à septembre. Politique d'annulation: Les réservations annulées ne seront pas remboursées. La maison peut être louée avec 5 chambres et 3 salles de bains (10 personnes maximum 8 adultes) ou 8 chambres et 6 salles de bains (16 personnes maximum 12 adultes). Le 5 lit (images 1-39). Le lit 8 (toutes les images). Que vous louiez 5 ou 8 chambres, la maison sera privée et vous aurez l’usage exclusif de la maison, de la piscine et des jardins.